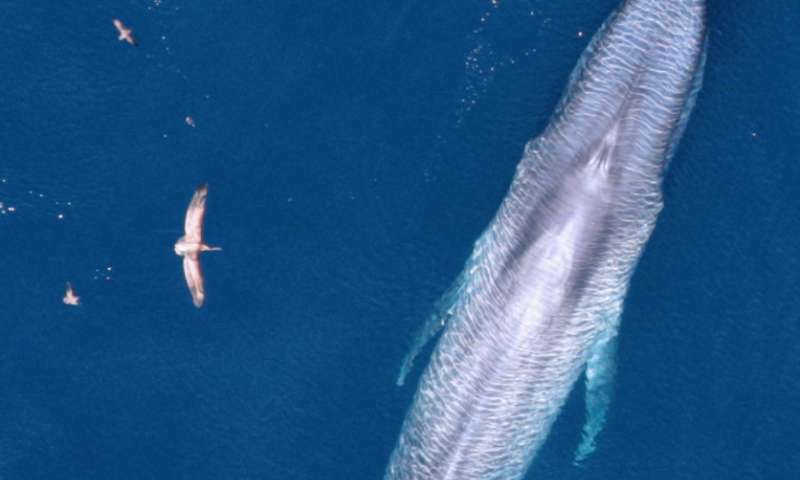 Scientists know a great deal about blue whales off California, where the endangered species has been studied for decades. But they know far less about blue whales in the Northern Indian Ocean, where ships strike and kill some of the largest animals on Earth. Now a research team has found a way to translate their knowledge of blue whales off California and in the eastern tropical Pacific Ocean to the other side of the world, revealing those areas of the Northern Indian Ocean where whales are likely to be encountered. 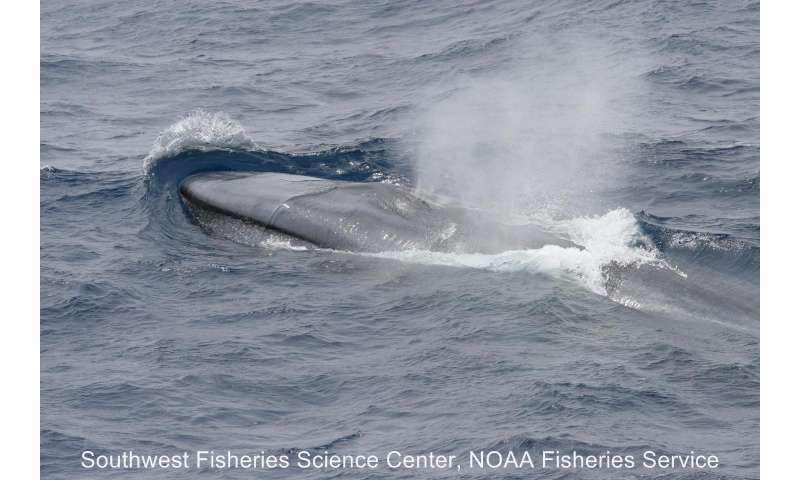 The team of scientists from NOAA Fisheries and the Sri Lankan Blue Whale Project published the findings in the journal Diversity and Distributions. The Scientific Committee of the International Whaling Commission included the results of the study when assessing a shift in busy shipping lanes off the south coast of Sri Lanka that will reduce the danger to whales in an important feeding area. "Small changes in shipping routes can be a very effective way to address a serious conservation issue with minimal inconvenience to the shipping industry, but rely on a good understanding of the relationship between whale distribution and habitat," said Russell Leaper, a member of the Scientific Committee. "This study makes an important contribution towards that understanding." To meet requirements of the U.S. Marine Mammal Protection Act, NOAA Fisheries regularly conducts marine mammal and ecosystem assessment surveys. Surveys off the U.S. West Coast and in the eastern tropical Pacific have shown that the upwelling of deep ocean water rich in nutrients supports dense patches of krill that blue whales feed on. This information has proven critical in addressing the emerging problem of ships striking blue whales, and has informed the management of ship traffic to and from the busy ports of Los Angeles and Long Beach to mitigate this problem. "We are fortunate in the United States to have some of the best marine mammal data sets in the world," said Jessica Redfern, a research scientist at NOAA Fisheries Southwest Fisheries Science Center in La Jolla, Calif., and lead author of the new study. "It was exciting to explore how we could use these data sets to aid conservation efforts in parts of the world where few data exist." The research developed computer models of blue whale habitat off the U.S. West Coast and in the eastern tropical Pacific, including upwelling and underwater topography that affects areas of krill concentration. The models then identified similar upwelling and feeding regions in the Northern Indian Ocean that are also likely to be important habitat for the endangered species. "The Sri Lankan Blue Whale Project has spear-headed efforts to draw attention to and mitigate the risk of ships striking blue whales in Sri Lankan waters. To best protect this species in this data-limited region, it is essential to adapt approaches developed in other parts of the world. Our collaboration achieves just that," said Asha de Vos, founder of the Sri Lankan Blue Whale Project and a coauthor on the study. The Northern Indian Ocean and its inhabitants have not been surveyed to the same extent as the eastern Pacific Ocean, and much of the information about whale distributions comes from Soviet whaling several decades ago. However, the model results matched up well with the limited information available, the scientists reported. The model suggests that the distribution of blue whales in the Northern Indian Ocean may shift seasonally, following their food as monsoon climate patterns alter the most productive habitat. The scientists concluded that research and monitoring is critical in the areas identified as blue whale habitat in the Northern Indian Ocean because many of these areas overlap with some of the busiest shipping routes in the world. "Marine mammals face threats from human activities in most of the world's oceans, but we lack the data needed to address these threats in many areas," Redfern said. "The data collected aboard our surveys allow us to predict species habitat in other parts of the world. Understanding species habitat allows us to address conservation problems that are often unexpected and critical to maintaining healthy populations."